In an effort to recognize the contributions of Molecular Connections Pvt. Ltd towards building sustainable careers for women, AVTAR Group & Working Mother Media has listed Molecular Connections Pvt. 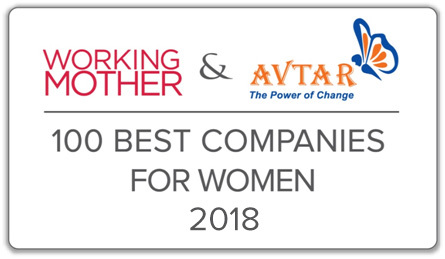 Ltd as part of the 2018 – 100 Best Companies for Women in India (BCWI). Currently in its third edition, BCWI Study aims to recognize and bring into foray the sustained initiatives undertaken by companies to increase women’s workforce participation. The 2018 edition had hundreds of companies from across industries, participating. Among which, Molecular Connections Pvt. Ltd emerged as one of 100 Best winners of the study along-side companies like P&G, Novartis, Astra Zeneca, Nestle, GSK, Unilever, Goldman Sachs, EY, Deloitte, BASF, ANZ etc. Commenting on the recognition, Mr. Jignesh Bhate, CEO Molecular Connections said: “There is a reason why Molecular Connections keeps getting titled one of the most desirable places to work for women& the reason is it’s “recherché workplace culture explicitly designed to inspire colleagues and cultivate creativity, that is envied by many”. This is evidenced by the fact that the company boasts in having women in leadership positions with an astonishingly high employee retention rate. Women here are great multi taskers, managers and add immensely to innovation at Molecular Connections. Molecular Connections takes pride in being a flat organization where opinion’s, ideas are heard and implemented at a lightning speed!! At heart we are a startup, within the body of a large institution. When your employees are happy, your customers are happy. When your customers are happy, all stakeholders are happy”. This award is a tribute to all women at Molecular Connections”. Molecular Connections Pvt. Ltd is renowned for pioneering initiatives that help women build a successful career and offer them a well chalked out growth path. In the last annual year, Molecular Connections Pvt. Ltd has introduced several key initiatives that help build a women inclusive workplace. More than 75 percent new hires are women and around 60 percent women are employed at top-level positions. Molecular Connections is the largest STM indexing and abstracting company from India with a strong technology focus, catering to content management and enhancement needs of organizations such as leading publishing houses, societies and associations, content and information providers, academic institutions & Pharmaceuticals. For over 3 decades, domain experts, data scientist, semantic enrichment technologists at Molecular Connections have been excelling at offering innovative, high quality, scalable big data solutions to its customers starting pre-press to content mining and indexing, meta data creation to thesaurus management, content slicing to architecture definition that aid in enhancing discoverability. Molecular Connections has been supporting organizations across multiple domains including sciences, medicine, engineering, technology to help productize its content. On the new product development front, Molecular Connections offers consulting solutions right from identification of resources, conceptualization & prototyping to aggregation of content, delivery of content in client desired format and UI/UX development.